美国海岸警卫队 - 18架 – 参见 EADS CASA HC-144 Ocean Sentry. ^ CN-235. Deagel.com. [13 June 2016]. 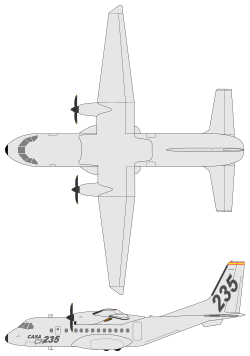 ^ CN-235 Persuader Maritime Patrol Aircraft – Airforce Technology. [5 July 2015]. ^ Military Aircraft Airbus DS – CN235. [5 July 2015]. （原始内容存档于16 April 2014）. ^ 7.00 7.01 7.02 7.03 7.04 7.05 7.06 7.07 7.08 7.09 7.10 7.11 7.12 7.13 7.14 7.15 7.16 7.17 7.18 7.19 7.20 Orders, Deliveries, In Operation Military aircraft by Country – Worldwide (PDF). Airbus Space and Defence. Airbus Space and Defence. 31 August 2015 [4 December 2015]. （原始内容 (PDF)存档于20 November 2015）. ^ 9.0 9.1 Hoyle Flight International 11–17 December 2012, p. 47. ^ Hoyle, Craig. Cameroon signs deal for CN235 transport. Flightglobal. 6 June 2012 [9 June 2012]. ^ Military Aircraft Airbus DS – Press Center. Airbus Military. [5 July 2015]. （原始内容存档于14 April 2014）. ^ Hoyle Flight International 11–17 December 2012, p. 48. 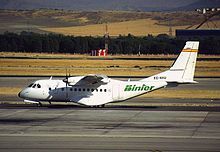 ^ CASA CN235. Defence Forces Ireland. 2014 [2014-08-25]. ^ Defence Security Report. Janes.com. 2008-12-03 [2011-10-02]. ^ Archived copy (PDF). [2009-06-20]. （原始内容 (PDF)存档于2009-03-19）. ^ John Pike. Pakistan Air Force Equipment. Globalsecurity.org. [2011-10-02]. ^ Hoyle Flight International 11–17 December 2012, p. 57. ^ 23.0 23.1 23.2 Jackson 2003, p. 207. ^ Hoyle Flight International 11–17 December 2012, p. 59. ^ Turkish Army Current Order of Battle. [5 July 2015]. ^ 28.0 28.1 Hoyle Flight International 11–17 December 2012, p. 61. ^ Hoyle Flight International 11–17 December 2012, p. 63. ^ Hoyle Flight International 11–17 December 2012, p. 64. ^ Oryx. Oryx Blog. [5 July 2015]. ^ bmpd. [5 July 2015]. （原始内容存档于2 May 2015）. ^ Mexican Police Aviation 互联网档案馆的存檔，存档日期2011-06-12.